Lone Star Muscle Cars is proud to present this one of a kind Reincarnation. 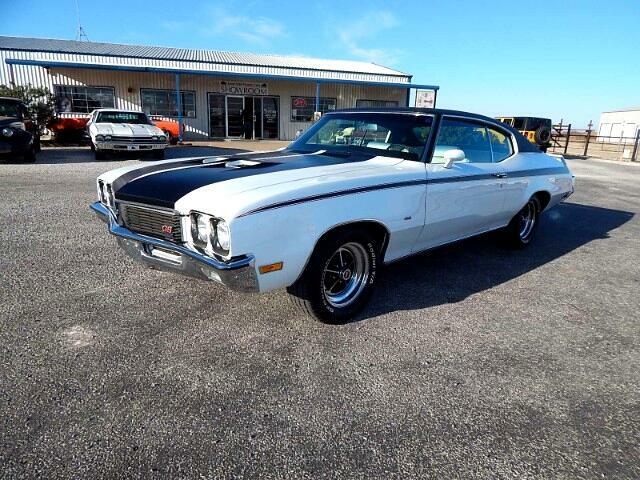 This Classic started out as a 1972 Buick Skylark Hardtop After a complete restoration and upgrades here we have a ultra show quality 455 Stage 1 GS-X Replica. On the exterior you will notice all correct stripe's and badges on the Apollo White Paint all new black vinyl top. Correct Factory Rally Wheels with raised white letter tires to accent the classic look of this muscle car. Here is your chance to own a super cool car at half the cost of a real one. Only 44 were produced in 72 so the price is well over six figures. The Interior is all new with White front bench and rear seat's all new carpet 8000 RPM tach 120 MPH Speedometer Fm Stereo Gauge Set and so much more. Power Front Disc Brakes Power Steering. Now for the heart of this beast A Rebuilt 455 CI From Performance Automotive In El Paso TX this Big Block Producing 576 Pounds of Torque and 475 H.P. At 4300 RPM on The Dyno. Coupled to a built 400 Turbo Automatic Transmission and a 10 Bolt POSI rear end pushes this Muscle Car Down The Road. Long Tube Headers and Flow Master Mufflers for that one of a kind sound. So don't let this one pass you by call today for more information. Message: Thought you might be interested in this 1972 Buick GSX.